Is what is happening in Iraq a civil war? For the families of the people who have been killed in the latest violence, and for the hundreds who have been wounded, it must feel like one already. Abu Musab al-Zarqawi, the leader of al-Qaeda in Iraq, wants it to be a civil war, judging by the latest statements attributed to him on the internet, which said that this week's bombs were the beginning of a war by Sunnis against Shias. It looks like a civil war. Gunman and bombers drawn, in the main, from one community are killing people from another one. One of the reasons why a life without fear is impossible in many parts of the country is that Iraqis are killing Iraqis. The central government in Baghdad is weak. It would not last very long without the protection of foreign troops. Law and order, such as it exists, often comes from militias and armed groups that are loyal, not to the central government, but to their own religious and ethnic groups. But while Iraq has all the ingredients for a war as bad as Lebanon's in the 1970s and 1980s, it does not have a full blown civil war - yet. That is because Iraq still has a political process. 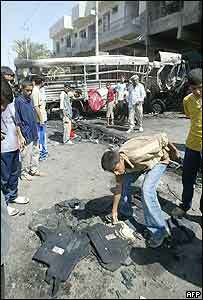 Just about the time on Wednesday when bombs were exploding in Baghdad, giving the capital its bloodiest day since the invasion, the Iraqi National Assembly sent the final draft of its new democratic constitution to the UN, which will print it and distribute it around the country. The assembly is dominated by Shias and Kurds, who have worked hard to make sure that they have a document that suits them. But the Sunnis, Iraq's other main community, are not happy, and could throw the constitution out in a referendum a month from now. The constitution is flawed, but it represents hope and a political option for the majority of Iraqis who want to stop the killing. That is why the insurgents will do all they can to destroy it, hoping that the killing will drive Iraqis apart faster than the politicians can bring them together. But if the constitutional referendum next month does not produce some forward momentum for the political process, and if they can kill enough people, the insurgents might succeed. Things still can get much, much worse in Iraq.